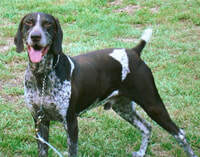 German Shorthaired Pointers come in a wide variety of colors ranging from solid liver to white with brown spots; there are even black GSPs. 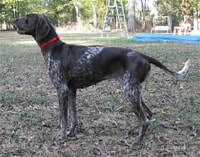 ​Below are several examples of the wide range of colors found in the breed. Black & White, Ticked and Patched with a Blaze. white is ‘extra white’ with patches. 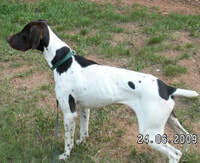 Solid liver GSPs; many also have white chests. Another misconception is that GSPs always have docked tails. While it can help in identifying a dog, it is not a rule. 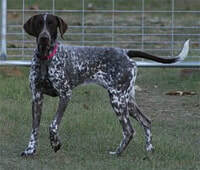 Below are some beautiful GSPs with undocked tails. 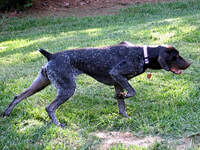 GSP’s can also vary in size; from females as small as 35lbs to males as large as 90lbs. 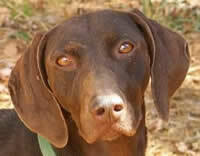 While GSPs vary in looks, they tend to all have a similar disposition. ​They are atheltic and energeic, but very people oriented. 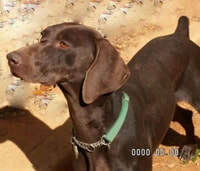 ​Sometimes mixes and English Pointers can be misidentified as GSP’s.